A giant hole almost the size of the state of Maine has opened up in Antarctica's winter sea ice cover, leaving scientists with a handful of unanswered questions. The hole, known as a polynya, was discovered about a month ago in Antarctica's Weddell Sea as a team of scientists from the University of Toronto and the Southern Ocean Carbon and Climate Observations and Modeling project used satellite technology to monitor a similar, much smaller, hole that opened last year. Scientists say it's the first time a hole of this magnitude has been observed in the Weddell Sea in over 40 years. In their observations, it has fluctuated in size up to a maximum of nearly 80,000 square kilometers. In 1974, an even bigger hole in the ice — 250,000 square kilometers — opened in the same location. Now researchers are trying to figure out why it recurred. "We don't really understand why it went away for 40 years and has come back now," Kent Moore, professor of physics at the University of Toronto, told CBS News. "It's like an enigma on many levels." There are two types of polynyas: coastal and open-ocean. Coastal polynyas form right at the coast, mainly due to strong winds which blow ice out of the area. "These coastal polynyas occur all the time. They're always there," Moore said. "Polynyas that form deep in the ice pack are a lot rarer. It's a different mechanism." Open-ocean polynas, like the one found in the Weddell Sea last month, are caused by the rising of warmer and saltier water from below. There's an underwater sea mountain located around where the polynya formed, Moore explained. Therefore, ocean currents around that area bring deeper, warm water toward the surface, where it can melt the ice away to create a polynya. "This is like opening a pressure relief valve — the ocean then releases a surplus of heat to the atmosphere," Prof. Dr. Mojib Latif, head of the research division at GEOMAR, a German marine research institution, said in an online statement. The surplus of heat makes it difficult for new layers to form. Eventually, the warmer water starts to cool, but with exposure to the frigid atmosphere, some water can get cold enough to sink. "That can allow this open convection to continue," Moore said. This may explain why polynyas can expand so rapidly, though researchers are still trying to understand the phenomenon, Moore said. Within the span of a week, the newly discovered hole grew from 10,000 square kilometers to nearly 80,000. 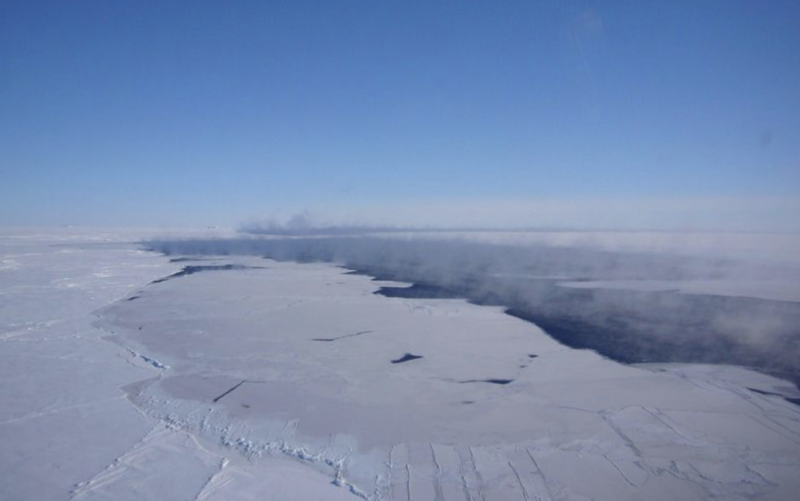 The cooling of the water that's caused by polynyas can impact the ocean's temperature, but Moore says it's still unclear how much of an impact a polynya such as this one could have on Antarctica's oceans and climate. "I think it's a bit premature to talk about a change in climate," Moore said. Researchers may not know what the long-term impacts the polynya will have on the environment, but marine mammals seem to be enjoying the break in the ice. "It literally is a hotspot," Moore said. "There are seals using it, predators, leopard seals — they'll be exploiting this region. It's like an oasis to them." Moore predicts the hole will stay open for the rest of the Southern Hemisphere's winter, but what happens beyond that is a mystery. "The giant hole came back three years in a row in the 1970s, then it just went away," Moore said. "I'll be interested to understand this one a little better. I check it every day."